I am Director of Drama at the First Presbyterian Church in Bonita Springs, Florida. I am interested in helping others develop Drama Ministries at their churches. 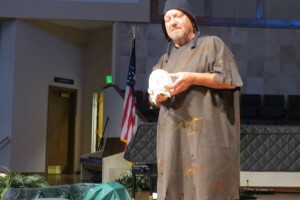 Look at videos of my recent plays at First Presbyterian Church on my website, Facebook, or Youtube. Technically the plays can be simple. You need to add a script, actors, and a director, and you can get started. Contact me for help. I’m available. In a New York Times review (11/12/15) of a New York production, the reviewer makes this very illuminating comment, “Ms Lloyd's “Henry IV” is, among other things, a celebration of the metamophic wonder of live stage acting, and of the distinctive insights it affords as we watch people transform themselves into others.” Isn't that the truth? A play starts with a text, but that is only the beginning. It's then the actors with their interpretation of the text, along with their movements and emotions that propel the work into THEATRE. But it's not only that. As director, I also see others involved in a production make the play a wonder. Watch the set designers. Witness the excitement in their faces they put together the staging, as in the recent production of my play SCATTERED ASHES in Florida. The set designers built right in the church an open grave and a graveyard, that made a wonderful contribution to the production! An open grave with a skull on top right on stage! THE EXCITEMENT OF THEATRE! What about costumes? In our production the costume designers transformed two actors arriving for rehearal in tee shirts and jeans into 14th century grave diggers. What MAGIC! And makeup. The actors had to look like they had already dug a few graves before they reached John Knox's grave to finish their jobs. Lighting? An important key to any production. Over the years ofdirecting my plays in Portland, Maine, the lighting technician in charge of the spot had some of the best comments and criticisms that really fueled the finished production. Don't forget sound. Most of large spaces like a sanctuary in a big church need amplification. Sound is key. If you don't hear the lines... WONDER in theatre is live stage acting but also the COLLABORATION of all involved in a production. So when the audience looks and listens, they experience THEATRE. As Theatre continues to celebrate Arthur Miller this year, a revision of “A View From The Bridge” opened on Broadway this past week. The reviewer for The New York Times brings into focus why a playwright like Arthur Miller is great while most playwrights are not: “Beneath the play's period trappings and kitchen-sink naturalism is pure primal force. In this centennial year of Miller's birth, his exalted notion that classic tragedy and common man can indeed coexist has never seemed so organic.” In too many produced plays today (or yesterday) the issues are small, the characters weak, and their actions trivial. Not in Miller's plays. The reviewer of “A View From The Bridge” continues: “None of the its characters are articulate, and much of the play's power comes from the aching gap between simple words and vast and complex feelings.” In another play that opened this past week, “The Humans,” described as “quite possibly the finest play we'll see all season,” the issues are not big, the characters are weak, and the actions manifesting the feelings of the characters are trivial. Are there in any of Miller's plays, actions by a character dominated by going in and out of the bathroom because of diarrhea? Miller's plays are worth producing over and over again (three major productions of “A View From The Bridge” in 5 years) because the issues are BIG, the characters are STRONG (even if inarticulate), and their actions (even if simple) MOTIVATED BY INTENSITY OF EMOTION. Let's write plays like Arthur Miller. Let the bathroom be used by the actors during intermission. Playwrights and directors agree on a lot of things about producing a play, but there is one thing they often disagree about: STAGE DIRECTIONS. As a playwright I don't understand why. When I write, I see more than talking. I see action. The mise-en-scene. What can happen when someone says, “I love you” on stage? Can a director really know what was in the playwright's mind—who wrote the play-- with just those words? “I love you” can elicit a response from the extreme of an embrace to a slap in the face. And everything in between. How can you direct (or act) in a play without knowing the response of characters to the words as the playwright intended? That is why stage directions are just as important as dialogue. A column in the November/December issues of The Dramatist, the journal of the Dramatists Guild of America, addresses the issue of stage directions. The writer, John Patrick Bray, Assistant Professor of the Department of Theatre and Film Studies at the University of Georgia, states that in his basic dramatic course students told him they cross out every stage direction “because stage directions didn't matter.” Where did they learn this? In high school! Although there are a variety of opinions about stage directions among playwrights, most feel that stage directions are just as important as dialogue. Stage directions reveal a major component of the inner life of characters that is lost if stage directions are ignored. How a character responds to “I love you,” can tell us even more than what they say. As Edward Albee has said, plays are literature and what is expressed on the page needs to be expressed directly on the stage. Just as a pianist can botch a piece of written music, so can an actor spoil a play by making choices not specified by the text.  The Dramatists Guild of America states, “Stage directions are part of an author's play, much like the title or dialogue itself.” Importantly where there are many earnest opinions about this issue, a spirit of collaboration must exist with all involved in a production regarding stage directions. For more discussion about this important topic, please read the full article “Stage Directions: Do Playwrights More than Dialogue?” in The Dramatist. While rehearsing my play SCATTERED ASHES in Florida in November 2015, one of the two actors was having difficulty memorizing his lines and actions especially when the other actor would miss a line or change a line. The first actor could not remember where he was—on the page and on the stage. A problem actors (particularly new actors) have is trying to memorize their lines and actions before they know how the play is developing. KNOW THE STORY AND THE LINES WILL COME. If an actor first reads the play and understands where the dialogue and action are going, it is much easier to learn the lines. In this way the lines and actions are absorbed organically and character can be developed in the rehearsal process. And if the actor does not understand where the play is going and how a line or action fits, ask the director and/or the playwright. There maybe be some logic behind the line or action that the actor does not understand, or maybe the line needs to be changed or deleted! Another example of this principal also occurred during the rehearsals of SCATTERED ASHES in Bonita Springs. It became obvious to both actors and all others at the rehearsal that a line was best said by a different actor than originally written for. Why? KNOWING THE STORY. The other actor had prior lines that build up to this particular line: “Almost forgot a big one!” This line referred to leaving John Wycliffe's skull on top of his grave that was dug up. Want to know more? SCATTERED ASHES is available on my website. KNOWING THE STORY worked during the rehearsals of SCATTERED ASHES, and the production benefited from it! Three of my plays dealing with international issues of human rights received staged readings at the Snowlion Rep Co on September 10, 2015. I called the program “A Night of Fashion: Three Plays About Clothes, Hair, Shoes, and Makeup.” The title was designed to be ironic. In each play the characters wish to live their own lives dealing with simple things, but are unable because of external forces and people. These plays were DRESS FOR SUCCESS, DRESSED TO KILL, and MAKEUP. The plays take place in Egypt, Nigeria, and Afghanistan. Photos of the actors in the plays are on my Facebook page. The plays were well received by other plawrights and directors. I was stimulated by the comments to develop the characters in the plays more fully and consider their total humanity. In this way characters both protagonists and agonists will be more real for the audience to see and the actors to portray. It was back to the keyboard the following day to make revisions! All for the better. All for better writing. There's nothing like seeing a production or having a reading of your work to stimulate re-writing your play to improve it. Among other works, I asked my tutor, Dr. Lynn Robson, at the University of Oxford to review my play SCATTERED ASHES. We met in early September 2015. She had intriguing suggestions regarding one of the characters, especially since the play was set in a grave yard. Lynn's comments were so helpful that I spoke with the actor whose role would be affected by the changes in the production of SCATTERED ASHES planned for November 2015 at the First Presbyterian Church in Bonita Springs, Florida. He was very enthusiastic about how the changes would enhance the character and make his acting more interesting. I have re-written the play based upon Lynn's suggestions. The Arts Ministry Director at the church found that the changes impacted the play in a very positive manner. Don't be afraid of comments of those that have seen or read your plays. These comments can be keys to finding deeper treasures in your writing. SCATTERED ASHES (with the new revisions as of September 2015) is available for your church. Have you already planned a play for Reformation Sunday this year (or want to start planning for next year)? Doesn't the story of John Wycliffe, the great English reformer and translater of the Bible into English, told by two gravediggers, intrigue you? Or is it one gravedigger and a...? This past week I concluded my 13th summer of attending rehearsals at the Theater At Monmouth. The theater in Monmouth, Maine is the designated Shakespearean theater of Maine. Over the years I have sat in on rehearsals of many plays by Shakespeare as well as other classical and modern playwrights. This has been a wonderful opportunity of watching a director work putting the text of a play to life on the stage with actors. During tech week, the whole production takes shape as all the elements of the show are added. This year I attended rehearsals of “The Winter's Tale” and “Fallen Angels.” This experience continues to be very valuable to me as a director and playwright. I highly recommend contacting a local theater company to learn by becoming the audience for rehearsals. Over thirteen years I have met a number of young actors as well as continued friendships with a many veterans who return to Monmouth each year to be part of this excellent repertory theater. I can't wait until next summer to do it again! One of the great experiences this year has been the opportunity of collaborating with my son in writing my play NYARING. Embedded in my one-act play is a song for which I wrote the lyrics. I asked my son Delvyn who is a composer to write the music for the song. This was the first time we have worked together artistically. Not only was it wonderful to work with my son, but I learned much from the experience. As Delvyn worked on the music, it was clear that certain words and phrases had to be revised to make the overall song work. 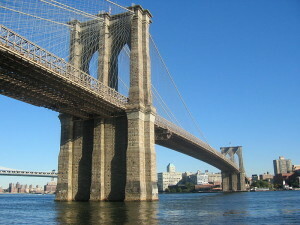 Such changes made the song build to a musical climax and resolution. Looking back on the experience I realized how the words of the song even without the music were more dramatic with the changes made. There is much to be gained through collaboration. It is exciting to see one's work develop more fully with the input of colleagues through critical review or artistic ideas. How do you make your play(s) more dramatic? Direct them! When I have the opportunity of directing one of my plays, I discover as I sit down for the first reading of the play as director my play appears like someone else wrote it. This is because I look at the play totally differently—as how the play looks on stage. Of course this should be how we consider all our plays as we write them, but a director carries with him the additional responsibility making the play come alive with real actors in real costumes, real staging, real props, and real lighting. Directing my plays has made me look at my plays with the eyes of a director. Directing my plays has made me think right from the first words on the page how much more dramatically my play can be. As a result directing my plays has made me a better playwright. LET THERE BE LIGHT! Proper lighting is crucial in focusing attention on the action on the stage. Don't lessen the impact of your drama by distractions. You'll want the best presentation of the message of a play whether it's in a church or a Broadway theater. Don't cheat the congregation (or audience). There's a simple way to focus attention on the actors on the stage of your church, and it costs nothing. Start with “killing” the house (sanctuary) lights and leaving on lights limited to the area of the stage where the action takes place. This will do much! 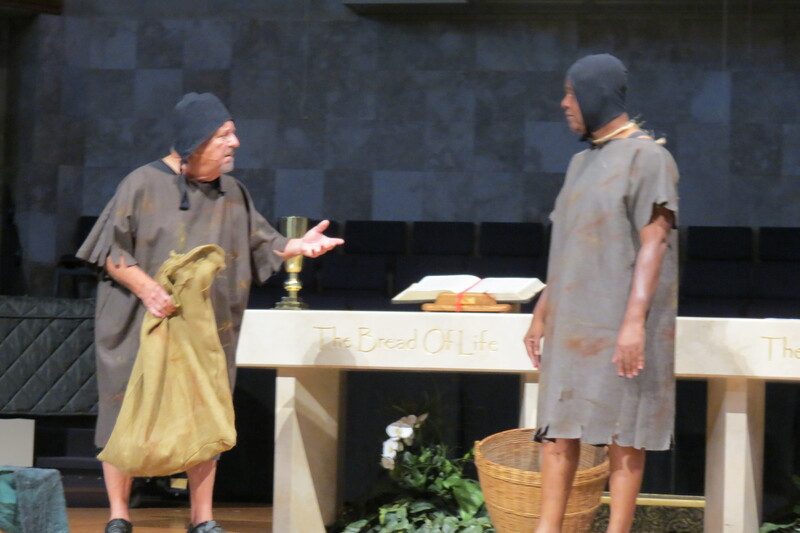 Watch the video of my play VALENTINE'S DAY 269 A.D.: THE END OF THE BEGINNING produced at the First Presbyterian Church in Bonita Springs, Florida, in February of 2015. Notice how attention is focused on the actors with the lighting “design” as described. Though you can see candlesticks on the altar, is the 150 person choir behind the action a distraction? https://www.youtube.com/watch?v=fhWWEzLLBX8 What's the next step? Order an inexpensive spotlight and use it. Concurrently reduce the stage lights. You'll like the result. You won't accept anything less for lighting in your next drama production at church! Have you considered having a Drama Ministry at your church, but are concerned that staging may be impossible on your altar/platform? Will the set of a play interfere with worship with the rest of the service? Will the set make it impossible for the choir/orchestra/pastor to move around after a five-minute play is completed? Little staging is all that is needed in most dramatic plays and should not be a barrier to producing a play during your church service. 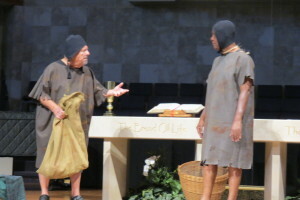 Watch the video of my play MARTIN LUTHER AT THE DIET OF WORMS: DAY OF DECISION produced at First Presbyterian Church in Bonita Springs, Florida. Only a table and chair are required. Add white and red linen coverings on the table along with a candlestick and several books, and you have the setting of the great turning point of the Reformation. https://www.youtube.com/watch?v=XvdsIzqiCEw Watch the video to see that this set does not impact the seating of the choir, the altar with candles, or the pastor sitting off to the side of the drama. The set was easily and quickly removed after the play was concluded. For SAINT VALENTINE'S DAY 269 A.D.: THE END OF THE BEGINNING only a small stool is needed to evoke the prison setting in Rome. No set pieces are needed to delevelop the confrontation of Patrick and an Irish king in SAINT PATRICK 440 A.D.: MISSIONARY TO IRELAND. In each production it is the script that makes the difference. If the written words and the actions of the actors are powerful, there is little need for elaborate or complicated staging. If you have a great script, you won't have to worry about the staging! Watch the videos of each of these plays to learn how easily your church can be transformed to another place and another time with little effort—and then be brought back to the present in 10 seconds or less. There's a theatre axiom that timing in comedy is everything. Even if timing is not EVERYTHING, it's an awful lot! So when you write and direct comedy, be aware of the comedic lines of the script and BE CAREFUL. Watch the video of my play THREE PEES produced at the 24-Hour Theater Project of the Maine Playwrights Festival in May 2015. Listen for the laugh lines. Did the audience laugh after each funny line? There were many laughs! Are there times the audience missed a humorous line and why? Remember timing. The playwright should share his idea of what lines are intended to be funny with the actors and director early in the rehearsal process. The actors and director should then test those lines on the stage. If possible have some audience later in rehearsal to help with timing and speaking. Lines that follow a laugh should be held until the laughter (if there is any) subsides. The actor should not continue to speak until the laughing stops. Otherwise the next funny line may not be heard and the next laugh missed.